Brent hates going to school because he has to do math everyday and thinks it’s very boring. His teacher, Ms. Peterson is explaining a math problem, and he feels she is speaking a different language. At the end of class, she reminds everyone that tomorrow is the Chapter Review test. Brent is worried because he doesn’t know how to solve the problems and doesn’t want to study. The next morning he wakes up and gets to school. He didn’t study and is sitting at his desk nervously waiting as the teacher passes out the test to each student. Brent looks down at the test and doesn’t know a single answer. He looks over to his friend Justine’s who is right next to him. Brent whispers to her and asks if he can see her answers. Justine thinks Brent is cute, so she moves her test to the side of her desk and lets Brent copy her answers. 1. What do you think are different ways people cheat? 2. Who will get in trouble for cheating? Brent, Justine, or both? 3. What are some consequences of cheating? 4. Why do you think Brent cheated? 5. What do you think his teacher will think about him because he cheated? What about his parents? 6. If you saw someone cheating, what would you do? ** Math and Science are the courses in which cheating most often occurs. ** According to one recent survey of middle schoolers, 2/3 of respondents reported cheating on exams, while 9/10 reported copying another’s homework. ** 24% of girls and 20% of boys admitted that cheating started for them in the 1st grade. ** Research about cheating among middle school children (Ages 12-14) has shown that: 1) There is increased motivation to cheat because there is more emphasis on grades; 2) Even those students who say it is wrong, cheat; and 3) If the goal is to get a good grade, they will cheat. ** Take Pressure Off. Kids often cheat because they see it as the only way to measure up to high expectations. Although it's good to expect the most from your kids, make it clear that you expect them to do their best, not be the best. ** Prep for Peer Pressure. Whether your child is involved in cheating or not, she will feel pressure to participate from peers at school, from friends asking to copy a last minute lab report to students passing notes across their desk during a test. Make sure they know that by saying “No” now, she's not only helping herself, but helping others in the long run. ** If your mentee discloses that they’ve cheated, help them determine why. If they're young, it could be because they don't know that cheating is wrong. If they're older, there could be other reasons. Maybe they feel too much pressure to do well on their tests. Or maybe they simply didn't study for a test because they were too busy watching TV the night before. If they're cheating at sports, they might be looking for a scholarship to their favorite college. Before you can decide the best method of action, you'll need to get to the bottom of their reason for cheating. ** Explain why cheating isn’t the best answer for problem-solving. Young children are generally trying to learn right from wrong. With them, you can simply explain that cheating is "wrong." But cheating isn't only wrong; it's unfair to those who work hard without cheating. Explain that cheating only undermines their actual abilities and makes them feel less confident. Hard work pays off much more than cheating because you actually get long-term benefits from it. ** Discuss the consequences of cheating. They might even think it's okay to cheat if there's no chance of getting caught. 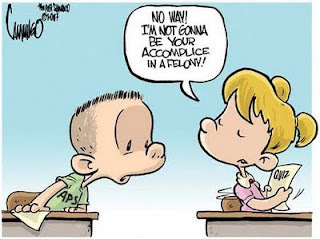 On top of reminding them why cheating is wrong, drill into their heads the consequences of cheating, including embarrassment, punishment and even prison if they get caught cheating at the wrong thing when they get older. Most children will simply avoid cheating because it's wrong, but you might need to use the "scared straight" method with others. Labels: cheating, school, test taking, What do you think? 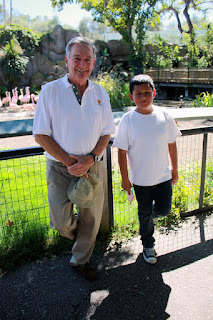 Steb and his mentee have been together for over three years. In that time, Steb has seen his mentee grow and develop into an intelligent young man. His mentee was referred to the program because he needed someone who would help him academically and bring him out of his shell. Although his parents were supportive, they were not able to help him academically because they only speak Spanish, so they were very excited to have Steb come into their son’s life. As soon as Steb and his mentee were matched, they began working on math, English, and his homework assignments. By including games such as Scrabble and dominoes, Steb has helped his mentee vastly improve his academics while showing how learning can be fun! But academics were not the only area Steb’s mentee needed support with, he is also a grade ahead of his age and struggled to relate to his peers. Steb worked with him to improve his interactions with others and encouraged him to try new activities around school. With Steb’s encouragement he has even started playing in the band at his school and Steb makes every effort to attend his band performances. Steb also takes his mentee to many Mentor Program Events so that he has ample opportunity to experience new things and enrich his life. Step has even helped at the Career Day event by participating as a job presenter. Through his great commitment to helping his mentee Steb has become an integral support system and friend and helped a struggling boy blossom into a promising young man. Thank you for all that you do for the program and especially your mentee Steb! Congratulations! You’re our October Mentor of the Month! Special Agent Enrique “Kiki” Camarena grew up in Calexico, California and joined the US Marine Corps in 1972. He served for 2 years before transferring to the Drug Enforcement Administration (DEA) division. In 1981 he was transferred to a field office in Mexico, where he was sent undercover to investigate a major drug cartel believed to include officers of the Mexican Army, police, and government. Kiki’s body was found a month later. DEA investigation showed that Kiki had been brutally tortured before his murder, and audiotapes recorded medical doctors had been kept by his side to keep him alive to further the torture and interrogation. 1. Did you know why we wore Red Ribbons the last week of October? 2. Even though Special Agent Camarena knew the dangers of his mission, he decided to embark on it anyways because he wanted to protect our country and his children from the dangers of drug trafficking. Are there things you do to protect your family? 3. Kiki gave his life to protect our country. Are you willing to wear a red ribbon to honor him and others like him? Will you take a pledge with me to avoid illegal drug use and illegal use of legal drugs (Rx drugs)? 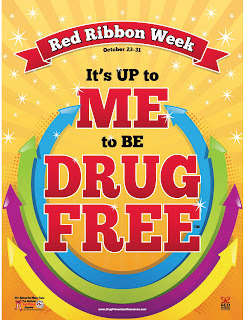 ** The 2011 Red Ribbon Week Theme is “It’s Up to Me to Be Drug Free”. ** Take the pledge for adult community members. You can find it here. ** Encourage your mentee to take the pledge at their school and to wear the red bracelet throughout the week. 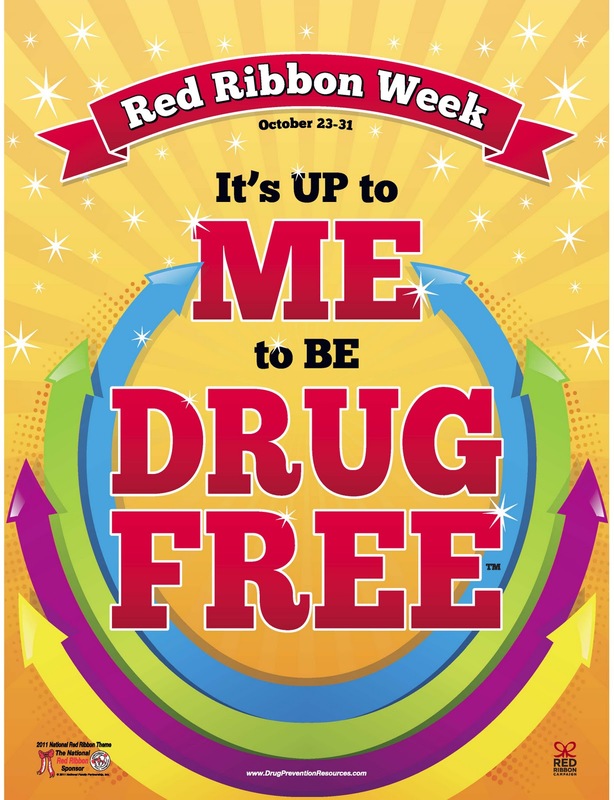 ** Thursday, October 27th is Wear Red Day in Santa Barbara County. You know what to do. ** Visit RedRibbon.org to see example facebook and twitter posts to spread the word about the Red Ribbon campaign. ** Think about participating in the Red Ribbon Theme contest for 2012. Click here for more information. Labels: alcohol, drugs, Enrique Camarena, red ribbon, What do you think? Bianca and her friends have hung out together since they were little. They’ve had the same teachers all through the 6th grade. But now they’re in junior high and don’t see each other all the time except during lunch. So they all set up Facebook accounts to connect during class and after school. Bianca didn’t want one at first, but her friends made an account for her and requested a bunch of “friends”. Over the course of the first day, Bianca had over 50 friends on Facebook. She noticed that everyone was talking about the big school dance on Friday. It’s now Friday and Bianca and all her friends are having a blast! Towards the end of the dance, Bianca gets asked to dance by a boy she has had a crush on named Kevin and she giggles with her friends before saying yes. As soon as the dance is over she gets home and logs on to Facebook. She starts talking to her friends about how much fun she had at the dance. Her friends are posting pictures of her and Kevin dancing and making comments on them. They are calling her really bad names, and making up rumors about her and Kevin. She doesn’t know what do to and sits in her bedroom, crying herself to sleep, dreading school on Monday. 1. Why do you think the girls are spreading these rumors about Bianca? 2. What should Bianca do to make the girls stop? 3. How would you feel if someone was spreading rumors about you online? 4. Who can you talk to if someone is spreading rumors about you? 5. Should Bianca retaliate towards the girls? **About 50% of teens have been the victims of cyber bullying. **Mean, hurtful comments and spreading rumors are the most common type of cyber bullying. **Girls are somewhat more likely than boys to be involved in cyber bullying. **Boys are more likely to be threatened by cyber bullies than girls. **21% of kids have received mean or threatening e-mail or other messages. **58% have not told their parents or another adult about something mean or hurtful that happened to them online. 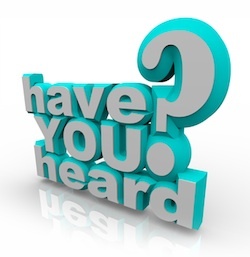 ***53% of kids admit having said something mean or hurtful to another person online. More than 1 in 3 have done it more than once. **Educate. Teach your mentee what to do in cases where they feel threatened or bullied. They should ignore the offender and contact an adult immediately. **Be your mentee’s support system. The biggest way to prevent your mentee form being a victim is to keep the lines of communication open. Your mentee needs to feel that he or she can come to you without negative repercussions. This also means listening carefully and avoiding the tendency to trivialize what they are experiencing. It may not seem like a big deal to an adult, but it can be a serious blow to the self-esteem of a child or teen. **Know the danger signs. You mentee may become more withdrawn or moody. They may spend more time online, or may refuse to use the computer altogether. They may cut off ties with friends. If your mentee gives any indication that they are being bullied on or offline, take it seriously and report it to your case manager or their school personnel. It is of utmost importance to make sure this doesn’t hurt them more or turn into something bigger. **Try to help your mentee understand. Ask if the rumor was meant to hurt them, or was it just a case of misinformation or exaggeration? Is someone trying to get back at them for something? **Talk with your mentee about resisting the urge to take revenge. Keep in mind that when someone starts a rumor meant to hurt another person, he or she is probably doing it because of insecurity or unhappiness. If you are a victim of gossip and rumors, you might want to think up lies or expose secrets that you know and take revenge. This might feel good, but only for a short time, and can potentially lead to serious consequences. Labels: bully, cyber gossip, gossip, rumor, What do you think? Junior High the classes are harder and his mom doesn’t speak English so she can’t help him. He used to play soccer but his mom forgot to send in the paperwork on time so he didn’t make the team this year. **Common street names for marijuana include: weed, pot, dope, ganja, grass, herb, Mary Jane, refer, skunk, sinsemilla, blunt, and joint. **According to the California Law, possessing marijuana is a misdemeanor with punishments depending on location and amount. However, if the minor is selling drugs it is a felony punishable by significant time in juvenile hall. **A minor in possession of less than one ounce of marijuana could be fined up to $100 and taken to a juvenile probation officer. If the minor has more than one ounce of marijuana in their possession the fine could be up to $500 and they could be sentenced to up to 6 months in jail (juvenile hall). 1st and 2nd time offenders can opt for a treatment program, such as through Teen Court, instead of regular court and probation. Their record is then wiped after successful completion of the program. **If the minor has marijuana on school campus he could be expelled along with a fine and potential jail time. **According to the Santa Barbara Healthy Kids Survey in 2011 6% of 7th graders have used marijuana in the last 30 days (4% on campus), and 33% believe that there is slight or no harm in smoking marijuana once or twice a week. **Talk with your mentee about drugs and alcohol early and often. It’s always better to prepare them before they ever encounter it. Make sure they know the realities of its use (why people like it and use it, how many of their peers actually use etc), how it will effect them physically, mentally, and socially, and potential legal consequences. It is very important to be honest about drugs rather than use scare tactics, teens will not listen if you only talk about the negatives without acknowledging the attractive aspects. **Ask them what they and their friends think about Marijuana, and don’t be overly critical of their answers, you want them to be open with you. **Share your own experiences with drugs and peer pressure (within reason of course) and help them learn from your successes and mistakes. And most importantly, make sure they know you are always there for them and will not judge them for telling you the truth about what they or their friends do. • While under the influence: Rapid, loud talking and bursts of laughter in early stages of intoxication. Sleepy or dazed in the later stages. Forgetfulness in conversation. Inflammation (redness) in whites of eyes; pupils unlikely to be dilated. Odor similar to burnt rope on clothing or breath. Brown residue on fingers. • Evidence of drug paraphernalia such as pipes, rolling papers, etc. ** If you notice any of these signs and/or suspect your mentee is using don’t be afraid to confront them about it, although be calm and caring when you do. Tell him or her the truth — that you know or suspect he/she is using marijuana. Be patient and listen. Make your best effort to be non-judgmental about what the teen is telling you. Let him/her know that you wouldn’t bring up the topic if you didn’t care about him/her, and you are only interested in his/her health and safety. **Tell them that you’ve read some materials on alcohol and drug use by teens and tell them what your expectations are for them, along with what happens if they violate the rules. Tell them that, while you’re no expert, you have access to experts in the community and that if they need help, you’ll be there. ** Talk with them about peer pressure. Ask if they have ever felt the need to do something they didn’t think was right because their friends asked them to. Try to problem solve with them and brainstorm ways that they can avoid the pressure next time. **Encourage your mentee to participate in afterschool activities because they are shown to significantly reduce drug use. 3pm to 6pm is the most common time for teens to use drugs together because they are bored and unsupervised. Labels: drugs, marijuana, What do you think? Mia loved to draw since she was a little girl. It started with flowers and doodles on her classwork. Then, when she was 11, her dad was sent to jail and her mom was stuck working 2 or 3 jobs at a time to support Mia and her 9-year-old brother. Mia loves her mom and looks out for her little brother, but she is upset and blames her mom for her dad going to jail. Her pretty doodles started to turn into doodles of snakes and fire where spelling words should have been on the test. She started to write her name not in bubble letters, but in different designs, sharp angles. She’d write her name, her friends’ names on her arms and her legs, in permanent ink. 1. What do you think Mia should do? Do you think this is an easy or hard thing for her to do? 2. Do you know anyone, who, like Mia, loves art? What do you think is a good place for her to practice her art? 3. What do you think is the punishment for vandalism? 4. Mia seems to use art as an outlet for her sadness and frustration. What is your outlet? 5. If Mia chooses to tag a wall and is caught, how will her brother feel? • Destroys the real or personal property of another." Vandalism is recognized as the deliberate damage or destruction of public or private property, without the owner's permission. **In California, if a youth under the age of 18 possess an aerosol container of paint, they can be charged with vandalism, even if they haven’t used it. **First time vandalism charges with minimal damage (less than $400) is generally considered a misdemeanor, and comes with no jail time, fines, restitution, community service, and 3 years informal probation. Sometimes misdemeanors can be elevated to felony charges if there is a prior criminal record, gang involvement, or if it’s a hate crime. **If the damage is $400 or more, and the defendant has had a prior vandalism charge, then the charges could be at the felony level, with punishments of jail, formal probation, restitution, and community service. 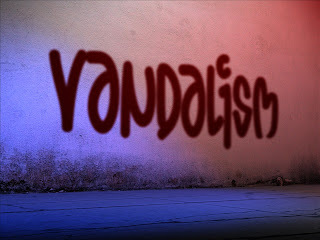 **Fines for vandalism charges could be anywhere from $400 to $5,000. **If you notice that your mentee loves drawing, even if it’s happy things, help them find a creative outlet. Create a scrapbook together, bring scratch paper from work and start off your meetings by drawing out their perfect day, or their saddest memory, or even what they want to be in the future. **Like Mia, many of our kids come from single parent households. If you notice that your mentee is having difficulty dealing with this, contact your Mentor Program advocate who can help by making a referral to their school counselor. ** If you notice your mentee is drawing on tables while you’re trying to work on homework with them, mention it. They may not realize they are doing it. You can ask them why and offer them a piece of paper to doodle on instead. Provide them with the scenario that it would be upsetting if someone came to their house and started etching something into their table at home. ** Talk with them about peer pressure. Ask if they have ever felt the need to do something they didn’t think was right because their friends asked them to. Find out how they handled the situation, how it made them feel. Talk with them…don’t judge their reactions, but see if you can help them come to a conclusion about doing the right thing the next time around. Labels: art, drawing, felony, jail, misdemeanor, peer pressure, tagging, vandalism, What do you think?